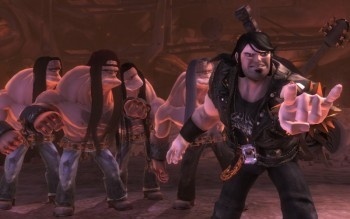 Former Black Sabbath frontman Ronnie James Dio, one of several heavy metal icons slated to make an appearance in the upcoming BrÃ¼tal Legend, has been removed from the game. Dio's management confirmed with Blabbermouth.net that his vocal work for the game has been cut, although the character he played has not: Dio is apparently being replaced by none other than Tim Curry. Nobody is saying yet why the change was made, although there have been suggestions that the rift between Dio and his Black Sabbath predecessor, Ozzy Osbourne (perhaps fueled by his wife, Sharon, who seems to have little tolerance for anyone who threatens to outshine her man), who also appears in the game, may have had something to do with it. The good news in all this is the addition of Curry, an actor of some repute who's not entirely unfamiliar with the realm of videogames: He provided the voice of the title character in the 1993 Sierra release Gabriel Knight: Sins of the Fathers and has performed in several other game roles since, most recently appearing as the diabolical Soviet Premier Anatoly Cherdenko in Commander & Conquer: Red Alert 3. An explanation for the switch will no doubt be forthcoming but in the meantime we can all have some fun theorizing about what happened. I'm betting on the simple, dull and obvious reason: Dio's voice work just wasn't making the cut and he had to be replaced. Ozzy's spot in the game is assured simply by virtue of his famously garbled speech, but Dio, while a great singer, doesn't have that immediately identifiable schtick to fall back on. Metal purists may be unhappy with the switch but sometimes it's just better to go with the pro.